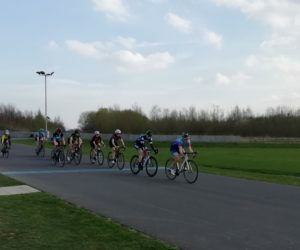 Last weekend we had two racers out at York Sport for the second round of the Winter Series. In the men’s E/1/2, Robbie Pollard pulled off an impressive 12th place in a tough and chaotic sounding race against some very strong opposition. 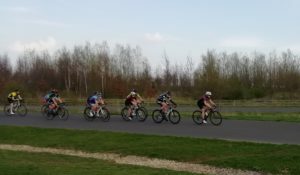 In the women’s cat 4, Helen Goldthorpe finished 7th in her first bunch race 2 years. She tells the story in her own words below. Over the last few years I’ve done a few bunch races but have often complained about the fact that as a 4th cat woman taking up riding as an adult you are thrown straight into 2/3/4 races with some really strong riders. This year that’s changed and I felt obliged to give it another go! After a nasty bout of flu over winter I finally felt ready to take the plunge this weekend at York. 12 of us lined up for the 4th cat womens race, most of whom had only started racing in the last year. Our start was delayed due to a crash in the race before us, and we started reassuring each other that no-one was going to do anything silly on the hairpin and we all wanted a safe learning experience. Finally it was our turn for a few laps of the circuit before lining up for the start. We made a fairly steady start as we got used to riding in a bunch and worked out how much grip there was on the bend, but fairly soon the pace started building. We lost a few riders off the back as the 30 minute race went on, but 9 of us stuck together as a group. I tried to make a move with about a lap to go but someone else ahead of me went for the same gap and I was boxed in, and ended up coming from too far back in the sprint. I managed to come past a couple of people to finish 7th and pick up 3 points. It definitely felt like a much more accessible introduction to racing than races I’ve done before. My average pace was actually faster than previous races I’ve done on that circuit but the attacks weren’t as hard so it was a bit less painful to stay with the bunch and get some good experience of racing in a group. It would be great to see more ladies giving it a go.